A few weeks ago I attended the church of a friend. I did not tell her I was coming and as I arrived I entered the nearest door to where I parked. A man greeted me at the door and I entered a large open area, that was virtually empty. I was not sure where to go, until I saw a young couple entering through double doors ahead. As I followed, I looked around me. The room was smaller in size, seating about a hundred, the walls were painted black, and the lighting looked like a theater. There was a slick, themed background for the praise band. There was a multitude of open seats and I quickly found one. The room started to fill and soon the praise band came out. The lights dimmed and were focused only on the stage. The music was extremely loud for the small space and I wished I had earplugs (and I like moderately loud praise music). I was familiar with all but two of the songs we sang, but I noticed very few people were singing. I realized as we progressed that we were actually in the overflow area. (I never saw my friend who was in the main auditorium.) The minister’s sermon was mediocre at best and when I later talked to my friend she told me he was filling in the for the main preaching minster that day. Once the service was over, I stayed around for a bit, waiting for someone to talk to me. I left without being greeted by anyone. I told my friend if that had been my first experience with church, I would never have returned. In sharp contrast, a couple mornings later as I sat down and opened my Facebook page, I saw a video clip from friends who are serving in a highly populated Muslim area in Africa. As I watched the video I was struck by the images there. They had posted video of three different tribes worshiping in music and praise. It was simple, joyful and so sincere. There were no professional lights, amplified music, and video screens. But I found myself drawn in by the sheer joy on the faces of the people. You could sense their enthusiasm and passion for the Lord. I wanted to be there and be a part of their worship. Before you become irate and bombard me with responses about doing things with excellence and giving our best, please realize I am not condemning out of hand all worship and praise teams. They have a hard job finding a balance of leading people in worship, and there are as many opinions of how it should be done as there are people sitting in the congregation. I just think maybe we need to step back sometimes and allow our worship to be more sincere and joy filled. 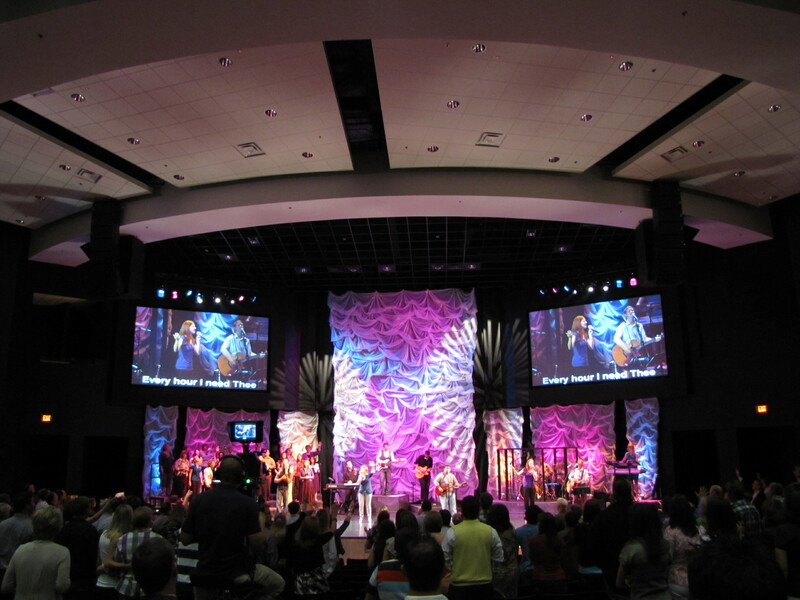 If leaving the lights on in the audience, lowering volume on the music, and singing more familiar songs occasionally, leads to a deeper worship experience, isn’t it worth it? I attended a church for awhile were I was only excited when the guy most people disliked in the church was preaching. He was the only pastor in the church who never wasted time trying to make people laugh, but faithfully taught the word. When the senior pastor was around people will be all happy, he would be cracking jokes and people have a good time. But it was merely a self help guide. The worship was professional but empty. The more I think about it the more I miss home, clapping hands and singing with our mouth.